Strong manufacturing growth maintained in July. Prices charged rise at survey-record pace. LONDON--(BUSINESS WIRE)--Canadian manufacturers recorded robust rises in output, new orders and employment during July, thereby signalling another marked improvement in overall business conditions across the sector. However, the latest survey also signalled a steep and accelerated rise in prices charged by manufacturing firms, which was widely linked to the impact of U.S. trade tariffs on steel and aluminium. At the same time, strong demand for raw materials and transportation bottlenecks led to a survey-record lengthening of delivery times from suppliers. 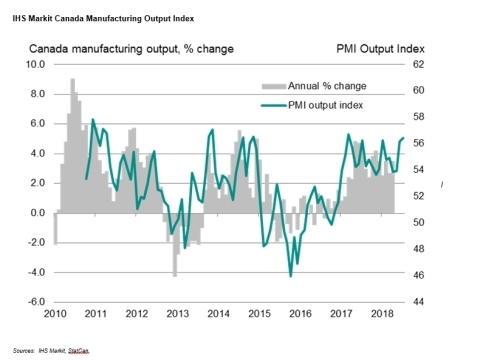 At 56.9 in July, the seasonally adjusted IHS Markit Canada Manufacturing Purchasing Managers’ Index® (PMI™) fell only slightly from June’s survey-record high of 57.1 and remained indicative of a strong improvement in overall business conditions. The headline index was supported by the fastest rise in production volumes since March 2017, which partially offset softer rates of new business growth and job creation compared to the previous month. Strong output growth was linked to robust order books and ongoing efforts to boost operating capacity across the manufacturing sector. Higher levels of production have been recorded in each month since November 2016. July data pointed to a robust increase in new work received by manufacturing firms, with the rate of expansion only slightly softer than June’s four-and-a-half year peak. The slowdown partly reflected a weaker contribution from export order growth, which was the least marked since March. Survey respondents noted that rising transport costs and, in some cases, output price increases related to trade tariffs had acted as a headwind to export sales growth. Manufacturers are upbeat about the outlook for production levels at their plants in the next 12 months. The degree of positive sentiment eased fractionally since June, but remained broadly in line with the average so far in 2018. Resilient business confidence and another solid rise in backlogs of work underpinned sustained employment growth in July. Intense supply chain pressures continued in July, as highlighted by the greatest lengthening of lead-times from vendors since the survey began in October 2010. Manufacturers again sought to compensate for worsening supplier performance by boosting their stocks of inputs. Input cost pressures eased only slightly from the seven-year peak seen in June. Survey respondents mainly cited the inflationary impact of trade tariffs for metal products, alongside rising fuel prices. Surcharges for raw materials were passed on to clients in July, with factory price inflation accelerating to a survey-record high. “The manufacturing sector continued to perform strongly during July, with growth proving resilient against a backdrop of intense supply chain pressures and escalating concerns about global trade. “Output volumes expanded at the fastest pace for almost a year-and-a-half, supported by strong order books and successful efforts to rebuild production capacity in response to rising client demand. “While domestic sales remained the main growth impetus in July, the latest survey indicated another solid upturn in new export orders. “Delivery times for raw materials lengthened to the greatest extent for over seven-and-a-half years, reflecting shortages of freight capacity and forward purchasing ahead of U.S. trade tariffs. IHS Markit does not revise underlying survey data after first publication, but seasonal adjustment factors may be revised from time to time as appropriate which will affect the seasonally adjusted data series. Historical data relating to the underlying (unadjusted) numbers, first published seasonally adjusted series and subsequently revised data are available to subscribers from IHS Markit. Please contact economics@ihsmarkit.com. The Supply Chain Management Association (SCMA) is Canada’s largest association for supply chain management professionals. We represent 7,500 members as well as the wider profession working in roles that cover sourcing, procurement, logistics, inventory, and contract management. SCMA sets the standards for excellence and ethics, and is the principal source of professional development and accreditation in supply chain management in Canada. www.scma.com. Purchasing Managers’ Index® (PMI™) surveys are now available for over 40 countries and also for key regions including the eurozone. They are the most closely-watched business surveys in the world, favoured by central banks, financial markets and business decision makers for their ability to provide up-to-date, accurate and often unique monthly indicators of economic trends. To learn more go to www.ihsmarkit.com/product/pmi. The intellectual property rights to the IHS Markit Canada Manufacturing PMI™ provided herein are owned by or licensed to IHS Markit. Any unauthorised use, including but not limited to copying, distributing, transmitting or otherwise of any data appearing is not permitted without IHS Markit’s prior consent. IHS Markit shall not have any liability, duty or obligation for or relating to the content or information (“data”) contained herein, any errors, inaccuracies, omissions or delays in the data, or for any actions taken in reliance thereon. In no event shall IHS Markit be liable for any special, incidental, or consequential damages, arising out of the use of the data. Purchasing Managers' Index® and PMI™ are either registered trade marks of Markit Economics Limited or licensed to Markit Economics Limited. IHS Markit is a registered trademark of IHS Markit Ltd and/or its affiliates.